To me, there is nothing more heavenly on my tongue than a melting morsel of brie. Now add in that I am a carb hound and cannot live without pasta…follow me to Pasta and Brie courtesy of Baltimore International College School of Culinary Arts. This recipe is PERFECT !! It combines 2 of my most favorite things in the world. I don’t know who at the Baltimore International College School of Culinary Arts came up with this recipe, but it outranks any pasta and cheese recipe that I have ever tried. It is true heaven. 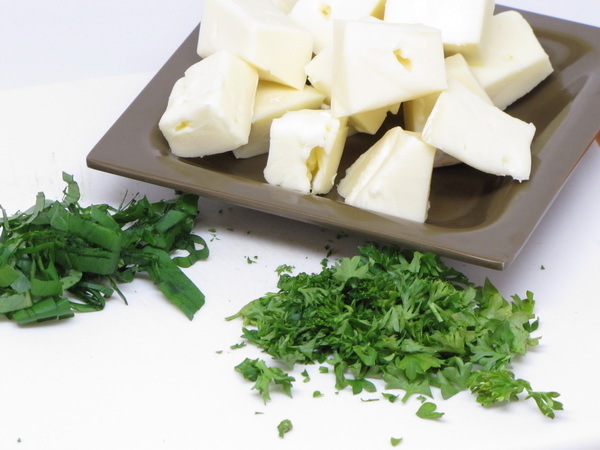 Along with the perfect brie flavor, the fresh herbs and pine nuts are just a flavor explosion. This is definitely one of those meals that will impress…and it’s not hard to put together at all. I tweaked their version just a bit to bring this in under 400 calories. It’s a bit high on the calorie count, so serve as a side to a light piece of fish – or have it for lunch. The portion size is definitely enough for a filling lunch and you won’t forget the cheesy brie goodness. Heat oil and broth and add in the tomatoes. Add in the garlic, parsley, basil, nuts, salt and pepper. Simmer for 10 minutes. Cook pasta according to package instructions. 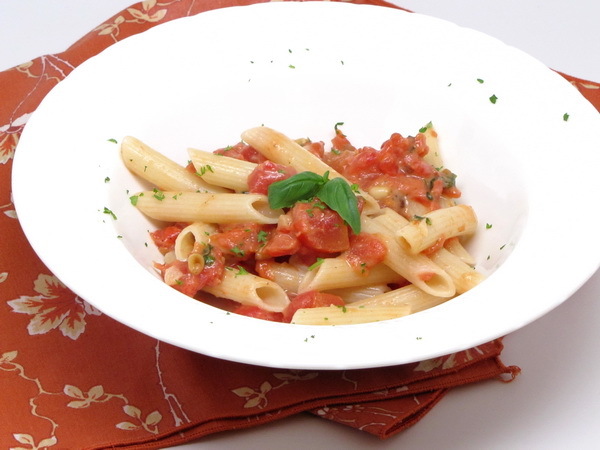 Stir brie into tomato mix and mix well to melt then pour it over the pasta and serve immediately. Meals that you start in the morning and then come home to much later are so convenient ! This soup has that great all day simmer flavor. And like many soups, it is so versatile – – have some extra peas this week, throw them in. 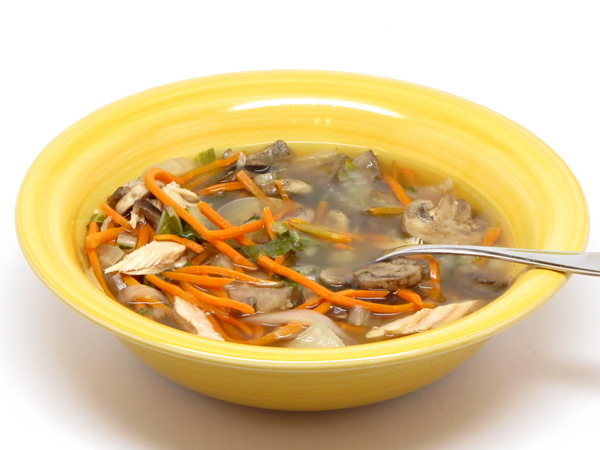 Have vegetable broth, but not chicken broth, switch it out. 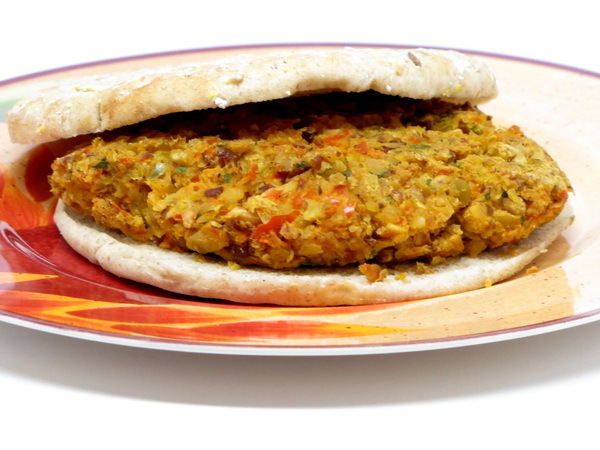 Have chicken instead of turkey…no problem ! Make this one your own ! In a 4 qt. crock pot mix turkey, broth, mushrooms, water, carrots, onions, soy, ginger and garlic (and optional chili sauce). Cover and cook on low 7-8 hours or high 4 hours. If cooking on low, turn to high heat after 7-8 hours and stir in bok choy and raw rice. Cover and cook 15 minutes more. Place garbanzos, peppers, carrots, garlic, red chile pepper, cilantro, tahini, salt and pepper in a food processor and pulse until ingredients are mixed evenly. If the mix is too dry, add a few drops of water. Refrigerate the mix 1.2 hour or more. Preheat oven to 350 degrees. Spray a cookie sheet with Pam. Make 4 burgers out of the bean mix and place on sheet. Bake 20 minutes, flip and cook another 10 minutes. You can also fry these in a medium skillet sprayed with Pam. The orange flavor in this dish is subtle and this is a perfectly easy way to make a great pork dish. 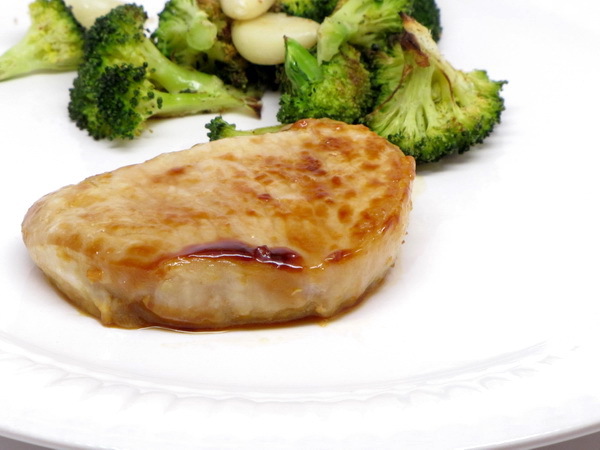 The brine solution definitely tenderizes and flavors the pork so don’t skip that step ! Dissolve the salt and sugar in a bowl with 4 cups of water and add the meat and let stand 45 minutes. Then rinse the meat and pat dry. Heat a grill. Place the orange juice concentrate in a pan and on low heat cook until it is reduced by half them mix in the dressing and garlic and brush over the pork. Cook the pork about 7 minutes per side or until well seared and done throughout. So much flavor !!! And I just love using cucumber instead of lettuce on a sandwich. This is a great lunch. Place meats on roll. Top with cucumbers. 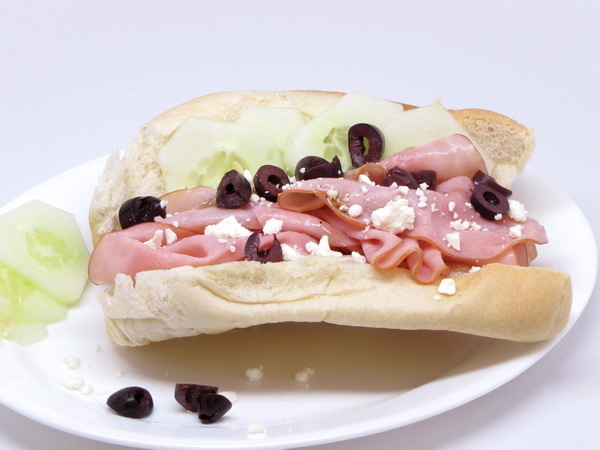 Combine cheese, olives and dressing and pour over sandwich. Sprinkle with oregano. 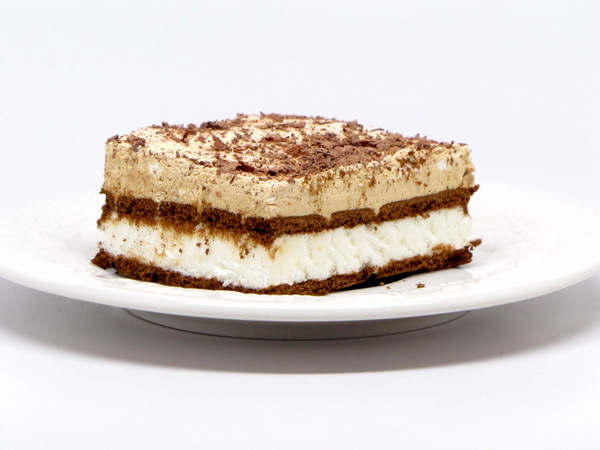 This is such a great dessert – so satisfying and definitely guilt free. The Cool Whip topping makes the ice cream sandwiches into something really special. If you don’t like coffee, try adding some vanilla or a flavored extract to the cool whip for some extra flavor. Dissolve coffee and sugar in hot water and fold into the cool whip. Arrange ice cream sandwiches in the bottom of an 8 inch square baking pan and spread with cool whip mix. Sprinkle with shaved chocolate, cover and freeze 2 hours. This is such a hearty vegetable dish ! The potatoes, parsnips and carrots really satisfy. Serve next to just about anything for a great serving of vegetables. Spray skillet with Pam, add oil and heat on medium high. Cook onions 25 minutes to caramelize and brown the onions. Add a tablespoon or more of hot water along the way if the onions start to dry out too much. Whisk milk and cornstarch and add to onion skillet along with broth, pepper and thyme. Heat on medium high heat and boil for 1 minute stirring continuously. Preheat oven to 375 degrees. 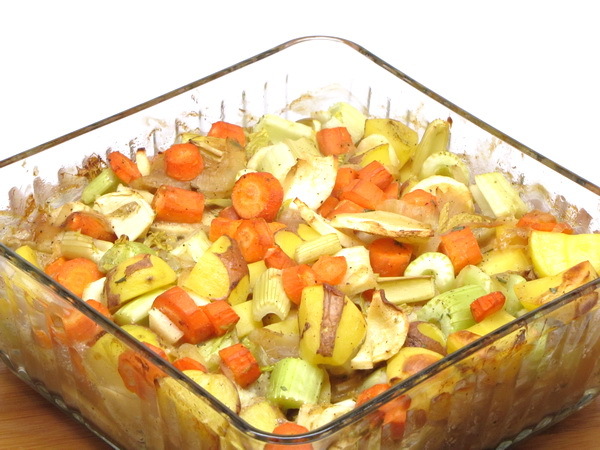 Combine potatoes, celery, parsnips and carrots. Stir in onion mix and spices/herbs and turn all into a 3 quart baking dish. Cover with foil and bake 45 minutes then remove cover and bake another 15 minutes, until golden and tender. A dish that many order in a restaurant – but you can do it for so many fewer calories at home…and it tastes great ! Cook pasta according to package instructions. Melt spread and oil in a skillet. Cook garlic on medium high heat for one minute then add pepper, onions, parsley and flour and cook another minute. Gradually add milk and blend and bring to a boil stirring constantly. Cook 5 minutes or until sauce thickens. Remove skillet from heat, stir basil, oregano salt and pepper and then toss with pasta. Sprinkle with cheese and serve immediately. Quite sweet and definitely tastes of the islands ! 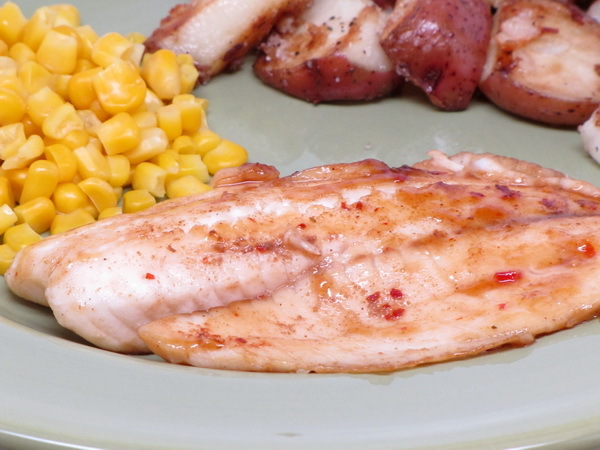 This sweet/spicy sauce would do well on any white fish, but I love tilapia ! Heat dressing in a skillet on medium high. Combine sugar, pepper and cumin and sprinkle 2 T over one side of the fish and put in skillet sugar side down then sprinkle with the rest of the sugar mix. Cook 5 minutes each side or until done. Remove from pan. Add juices to skillet and heat through then stir in cilantro and mint and spoon over the fish. 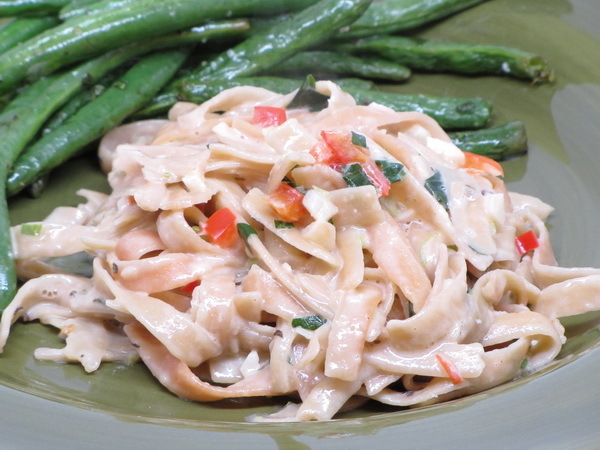 I love side dishes the combine a carb with veggies – it’s one less dish to have to prepare. 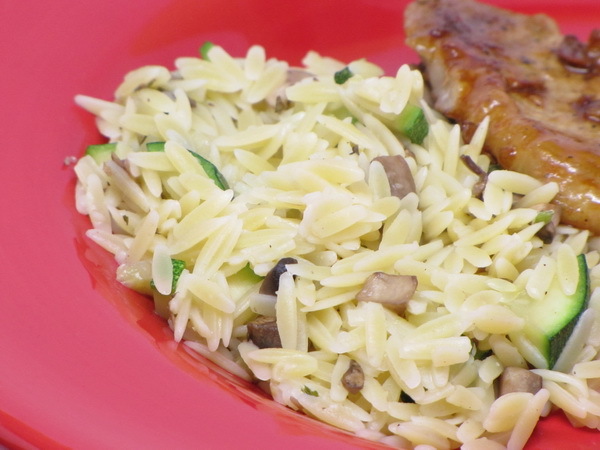 And this one has orzo, which is one of my most favorite small pastas. It’s a perfect side dish ! Cook pasta according to package directions. Heat skillet and spray with Pam. Saute mushrooms and zucchini 6-8 minutes. Mix pasta, mushroom mix, butter and spices.